By Sinead Makk | April 29, 2013. As the poor economy persists, more and more Irish people are looking for somewhere cheap within the country to spend their holidays. Despite the bad weather, Ireland is home to some beautiful, and more importantly, affordable tourist destinations. County Clare, situated on the renowned West Coast of Ireland is the perfect spot for holiday makers on a budget. Roughly a three hour drive from Dublin, Clare is home to some of Ireland’s most well-known tourist spots from the world famous Burren, to the stunning Cliffs of Moher, there is something for all the family. 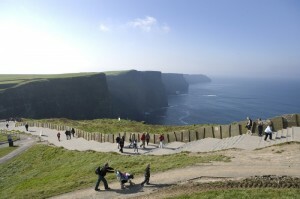 The Cliffs of Moher give tourists a breath-taking view of the Atlantic Ocean. 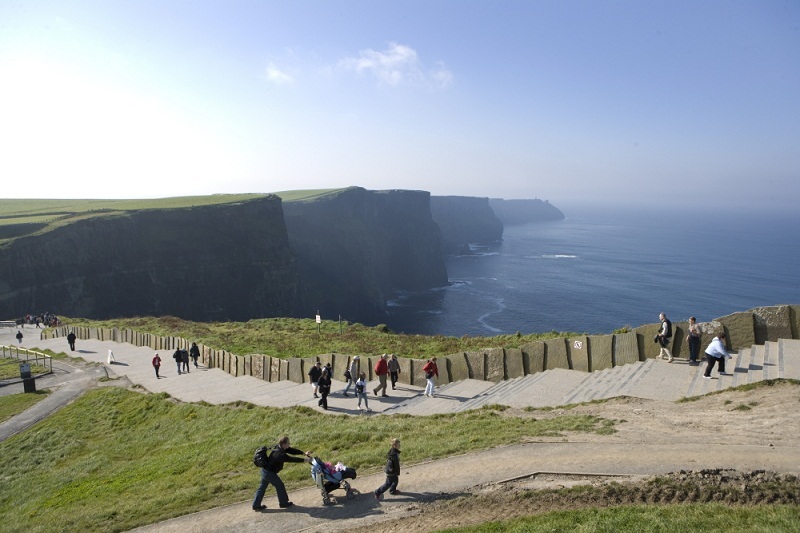 Standing 214 metres high, the cliffs receive almost one million visitors per year. There are two walking routes along the cliffs, a stone pathway which has been paved specially for tourists and a more rustic dirt track running opposite to it. However, as the cliffs are very dangerous both routes have limited access and are laced with signs warning visitors to stay as far back from the edge. Even at a slight distance, tourists can still see stunning views of the surrounding cliffs and sea. The Cliffs of Moher is also home to a visitor’s centre where sightseers can stop for a cup of coffee, lunch or purchase a souvenir. Although the Cliffs themselves are free to visit, there is a car parking fee. Another great spot in Clare is the Burren. The Burren is one of the largest karst landscapes in Europe and like the Cliffs of Moher; it attracts many tourists each year. The Burren charges a small fee for entry but in return provides a fun filled day out for tourists. Located within the karst region is the Ailwee Caves, are the famous ancient caverns hidden beneath the Burren. The Ailwee Caves also charge a small fee, with family tickets from as little as €29.00. The Caves are also home to a Birds of Prey Centre, where visitors can get up close with birds such as hawks and eagles and watch some amazing flying displays. The Spanish Point is a hidden gem in the heart of Clare and a great place to stay during your visit. In this little village, there is an array of holiday homes and a hotel from which visitors can choose. It also plays host to one of the best surfing beaches in the county and is a popular beach for water sports lovers. For golf lovers, there is also a nine hole golf course in the town. Just a stone’s throw away from Spanish Point is the picturesque Lahinch. This is another great village for holiday makers to stay during their trip. Slightly livelier than Spanish point, Lahinch boasts an abundance of pubs and is also home to three nightclubs, the nightlife won’t disappoint. Kayaking, Surfing, Swimming and Scuba diving are just a few of the activities the family can do one of the many beaches of Clare. County Clare is a holiday haven and provides tourists with everything they need for an enjoyable holiday, from culture to entertainment packed activities; this quaint county is definitely worth a visit, especially for those on a budget.